Is cluiche lítrithe é an cluiche Top That agus tá sé oiriúnach do réimse aoiseann, chomh fad agus atá siad in ann , nó ag déanamh iarrachta, litrithe. Cuidíonn sé go mór le daoine atá ag iarraidh litriú Bearla a fhoghlaim. Sa chluiche seo tá dhá shraith dísle, gorm d’imreoir amháin, buí don imreoir eile. Le hocht ndísle sa sraith, agus 12 thaobh ar gach dísle, tá rogha iomlán de 96 litir á ‘ caitheamh’ ar gach seal agus caithfidh na himreoir an litir is fuide gur féidir leo a chruthú as na litreacha ar ghaidheanna uachtaracha na ndíslí. Is féidir an cluiche a imirt in aghaidh imreora eile, nó mar chluiche aonarach. Is féidir é a imirt ag comhaireamh scóranna na litreacha i ngach babhta nó mar scór iomlán de litreacha úsáidte le linn an chluiche (naoi mbabhta de ghnáth). Tá leagan Gaeilge den chluiche seo (Thar Barr), foislithe ag Glór na nGael, ar fáil ar cliche.ie chomh maith. Top That is a new spelling game which is suitable for any age, and is also a great game for helping those learning to spell in English. The game consists of two sets of dice, one set for each player. 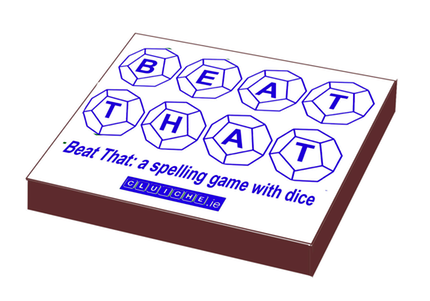 There are eight 12 sided dice in the set and players compete to create the longest words from the letters they ‘throw’. The game can be played against an opponent or as a solo game. It can be played with score accumulating by the number of letters used in each round or by the total number of letters used during the game (usually nine rounds).